The five-cent Samuel Hart & Company stamp was issued from September 1886 until sometime in 1877. A total of 3,613,000 were issued on old paper and 4,516,053 on silk paper. The copy above was printed on silk paper. 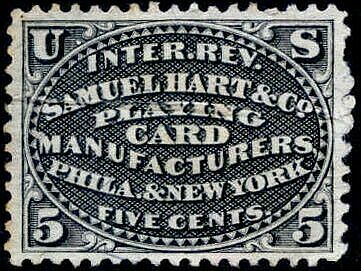 Samuel Hart & Company was in existence prior to the printing of its private stamp and is known to have used first issue playing card and proprietary stamps. 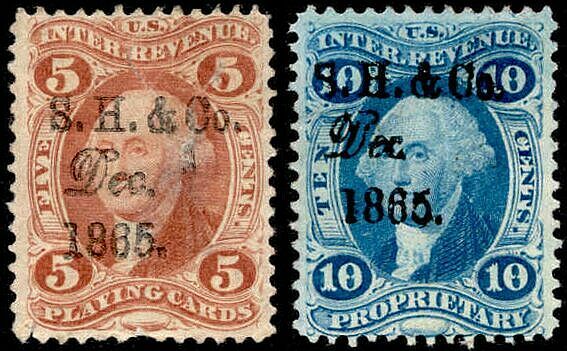 In December of 1865 stamps of these denominations would have been suitable for paying the tax on packs of cards priced over 25 cents.